Gold demand in big consumers like India and China declined by 26 per cent and 18 per cent respectively, said the world gold body on Tuesday. Demand in India dropped to 190.3 tonne during the January-March quarter due to higher import duties and supply curbs imposed by the government, the World Gold Council on Tuesday said. 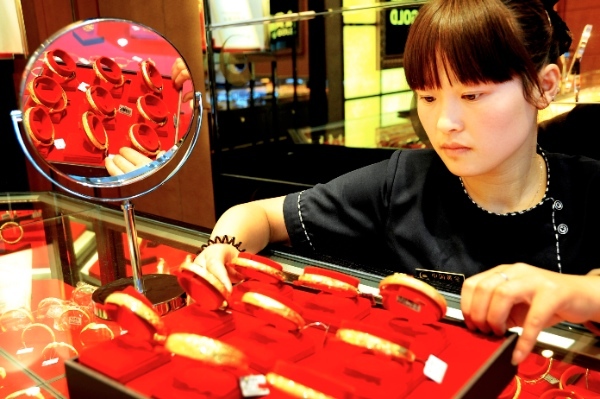 Consumer gold demand in number one buyer China fell to 263.2 tonnes. In the first quarter (Q1) of 2013, the gold demand in India had logged in 257.5 tonne, according to WGC Gold Demand Trends report. “During Q1, 2014 the demand went down by 26 per cent illustrating the continued impact of higher import duties and supply curbs imposed by the Centre to reduce the Current Account Deficit due to which gold prices were higher in the spot markets,” WGC Managing Director, India, Somasundaram P.R. told the Indian state news agency PTI. He said however that gold continued to enter India through unofficial channels although the estimates of the grey market vary, and there is now a far greater understanding of the adverse impact it is having on the gold industry. “Gold demand in UAE went up by 13 per cent, which shows that many Indians are buying there and bringing it to the country,” he pointed out. Total investment demand for Q1 2014 was down by 54 per cent at 44.7 tonne from 98 tonne in the same quarter last year. In value terms, gold investment demand dropped by 59 per cent to in the same quarter last year. “With the election of the BJP and its declared pro-business approach, there is an expectation that the short term curbs will be removed creating a favourable system that deals with gold as a fungible asset category, reflecting its importance in culture,” Somasundaram said. In 2014, gold demand is expected to be around 900-1,000 tonne, he added. Meanwhile, Chinese demand for gold coins and bars down 55 percent in the first quarter of 2014, said Tuesday’s report. Gold demand in China had reached a record 1,066 tonnes in 2013. But why? Is it actually demand that is down, or ability to acquire more (i.e. is supply constricting)?